What does it mean to approach Everyday Life with an aesthetic attitude? There is nothing novel about framing one's quotidian roles in some state of mind -- wisdom, science, religion. As practice, the aesthetic attitude is included within a situation, adding to the intentionality of some project the distance that generates aura of signification. "Situation" is a guideword, evoking the existentialist point that circumstances become a situation when considered from the point of view of one's "project," the goals of a practice, encountering a scene not indifferently but according to its affordances for some purpose. In a Visit (for konsult) this project or purpose is given an aesthetic frame. Family: Mother's Day holiday, with three generations of relatives sharing a rented house. Work: Ulmer continues to ponder the perplexities of a theoretical question (the image metaphysics of electracy: the diadoch Damascius). Memory: A formative experience in Ulmer's past -- a night in an olive orchard in Spain, 1966. Current Events: History of the present unfolding in daily reports and analysis of the raid that killed Osama bin Laden. 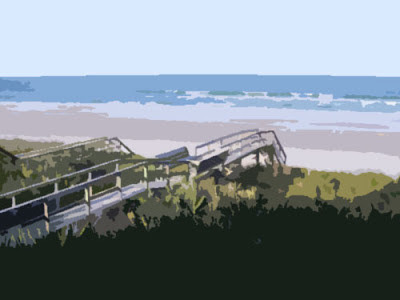 Site: Place, Ponte Vedra Beach on the Atlantic coast of Florida. Form: The Aesthetic Attitude includes familiar forms and genres, constituting a mythology: popular culture for laymen, but for Ulmer (academic) the forms are high art (Titian's Allegory of Prudence, Kafka's aphorisms). A relevant context to Visit as the construction of an epiphany is the common experience in the history of creative insight of the Eureka moment appearing during some ordinary activity: Archimedes in his bath; Poincaré stepping off a bus. In Ulmer's relay, adopting the Aesthetic Attitude means that he consciously scans his setting for some feature he recognizes as an objective correlative for his state of mind, registering the Mood or atmosphere attuning as vehicle and tenor (outer and inner) dimensions of his life world. The feature he recognizes, promoting it to object @, is the sand castle built by his granddaughter the previous evening.